2014 was a big year for me: it was the year that I met Stephen King. Not in real life, of course… I met his books. It was love at first read. I never really thought I would be a Stephen King fan. When my friends snuck into horror movies in high school, I rolled my eyes and leaned towards the Disney Pixar films. Somehow, in college, I got talked into watching The Shining, and fell asleep while Jack Nicholson dropped his famous “Heeeeeeeere’s Johnny!”. I just never got the hype, and instead of looking into it, I just dismissed it as not “my thing”. I saw kazillions of Metro riders glued to his new book Doctor Sleep when it was released last fall, and vaguely remember thinking to myself: Hmm… a lot of people are reading that. What’s the deal? That same “what’s the deal?” echoed in my head when I saw Doctor Sleep on display at the library. It was on the Express 21-day shelf, which is the book version of “I’m a pretty big deal”. Curious, I cracked it open and meant to read a page or two and then head home. The next thing I knew, I was almost finished with the book and hadn’t moved from my seat. I hadn’t eaten, and the only reason I paused was the librarian letting all patrons know that it was closing time. Without my noticing, three hours had passed. I knew that I was head-over-heels. Doctor Sleep led to a month-long kick where all I read was Stephen King. I even re-watched The Shining movie to see if it was any good now that I had read the book. Spoiler: it wasn’t. Writer Paul is seriously injured in a car crash, and “rescued” by his biggest fan, Annie. With his legs shattered in the accident, Paul is at her mercy, and learns quickly that Annie calls the shots. She’s also more than just a fan, she’s his biggest fan, and when his latest book doesn’t have a fairy tale ending, Annie demands that Paul write her a new one. And Annie will do anything to get the story she wants. There is no way to tell this story without spoilers, and even with the spoilers there is no way to explain how terrifying Annie is. King really is the master of that slow, simmering dread. Annie is “solid”, “the goddess”, and these seemingly harmless words are twisted to perfectly describe how awful she is. My absolute favorite. That slow-building dread that I love is basically this entire book. The Overlook Hotel has this legendary presence that is an extremely developed character of its own, and you can feel it start to slowly invade every corner, including the people. My absolute favorite part of this book was the playground surrounded by animal-shaped hedges where a boy was rumored to have died years before. When you take your eyes off the hedges, they creep. I can’t do justice to the way the whole hotel just seems to creep. I love it. This is only kind of a sequel. It starts off where The Shining ended, but years and years later, and the story is so different that it doesn’t read like an epilogue. The little boy from the Overlook Hotel is all grown up and is still haunted by his “shine”. His winter at The Overlook and the years following have haunted Danny, and he rolls around the country, drinking to dull to the memories and bouncing from job to job. When he hits rock bottom, he joins AA and finds a permanent home in New Hampshire. Danny, now going as Dan, begins to build a life for himself. He sees ghosts as if they are alive, and can sense if someone is going to die. He uses this gift to work in a hospice center, easing patients to the other side when they are ready. Dan’s gift is recognized by the nurses and he earns the nickname “Doctor Sleep”, hence the title. Soon enough, Dan’s mind is visited by another who has the shine, and learns that her name is Abra. As in, “abra cadabra”. I loved this book, but that was the one part that I just couldn’t deal with. Anyway, Abra Cadabra has a powerful supernatural gift, which calls to other supernatural beings who are hungry for what they call “steam”. Abra is not safe, and she and Dan team up to fight against this group of monsters who want to literally eat her soul to stay alive. This book was so good at the time, but looking back, it definitely has a different style than other Stephen King books. It had a thriller feel instead of that dread that generally characterizes his writing. There was nothing in it that truly horrified me; there were no points where I needed to just walk outside for a minute and remember it was only a book. If this wasn’t my first King book, I am not sure if I would have liked it so much. Back then, I was easily impressed. Now I have King standards. Retired overweight cop tries to stop a serial killer before he can commit another mass murder. This book is classified as a thriller, but it wasn’t particularly thrilling to me. 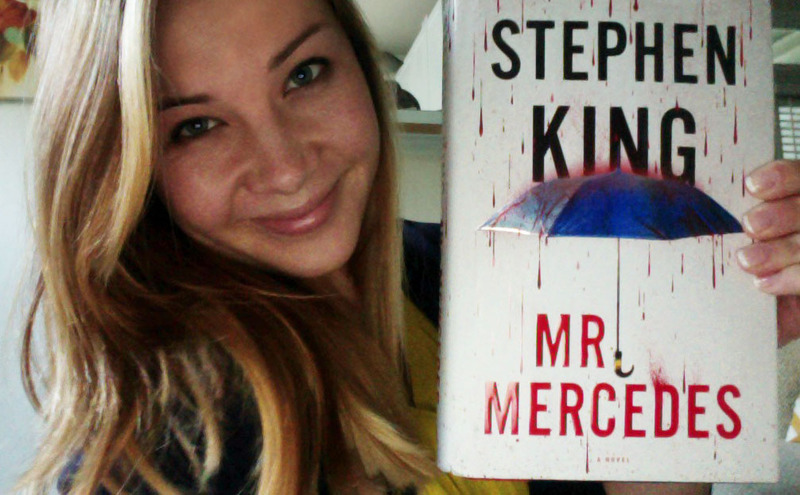 Honestly, the best part of this book was that it made my roommate a Stephen King fan! She had never read his books before, and had no desire to. When our book club chose this as our monthly book, she was pretty much forced to read it, and she loved it.